Learn the basic structure of a CSS layout and how to design pages and content using CSS in Dreamweaver. A CSS page layout uses the Cascading Style Sheets format, rather than traditional HTML tables or frames, to organize the content on a web page. The basic building block of the CSS layout is the div tag—an HTML tag that in most cases acts as a container for text, images, and other page elements. 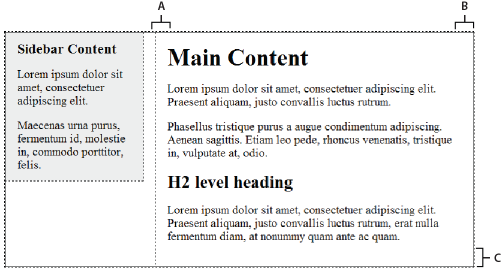 When you create a CSS layout, you place div tags on the page, add content to them, and position them in various places. Unlike table cells, which are restricted to existing somewhere within the rows and columns of a table, div tags can appear anywhere on a web page. You can position div tags absolutely (by specifying x and y coordinates), or relatively (by specifying its location with respect to its current location). You can also position div tags by specifying floats, paddings, and margins—the preferred method by today’s web standards. Before proceeding with this section, you should be familiar with basic CSS concepts. The basic building block of the CSS layout is the div tag—an HTML tag that in most cases acts as a container for text, images, and other page elements. The following example shows an HTML page that contains three separate div tags: one large “container” tag, and two other tags—a sidebar tag, and a main content tag—within the container tag. In the above example, there is no “styling” attached to any of the div tags. Without CSS rules defined, each div tag and its contents fall into a default location on the page. However, if each div tag has a unique id (as in the above example), you can use the ids to create CSS rules that, when applied, change the style and positioning of the div tags. 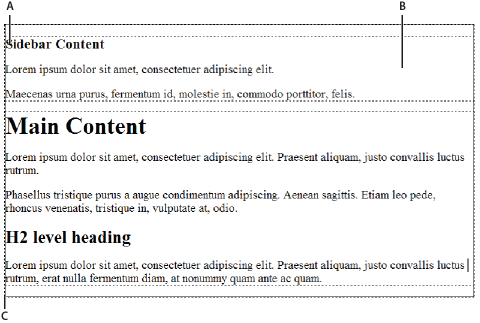 The above example code is a simplified version of the code that creates the two-column fixed left sidebar layout when you create a new document using the predesigned layouts that come with Dreamweaver. When creating a new page in Dreamweaver, you can create one that already contains a CSS layout. Dreamweaver comes with 16 different CSS layouts that you can choose from. Additionally, you can create your own CSS layouts and add them to the configuration folder so that they appear as layout choices in the New Document dialog box. For Page Type, select the kind of page you want to create. For Layout, select the CSS layout you want to use. You can choose from 16 different layouts. The Preview window shows the layout and gives a brief description of the selected layout. Column width is specified in pixels. The column does not resize based on the size of the browser or the site visitor’s text settings. Column width is specified as a percentage of the site visitor’s browser width. The design adapts if the site visitor makes the browser wider or narrower, but does not change based on the site visitor’s text settings. Select a document type from the DocType pop‑up menu. Select a location for the layout’s CSS from the Layout CSS in pop‑up menu. Adds CSS for the layout to the head of the page you’re creating. Adds CSS for the layout to a new external CSS stylesheet and attaches the new stylesheet to the page you’re creating. Lets you specify an existing CSS file that already contains the CSS rules needed for the layout. This option is particularly useful when you want to use the same CSS layout (the CSS rules for which are contained in a single file) across multiple documents. If you selected Add to Head from the Layout CSS in pop‑up menu (the default option), click Create. If you selected Create New File from the Layout CSS pop‑up menu, click Create, and then specify a name for the new external file in the Save Style Sheet File As dialog box. If you selected Link to Existing File from the Layout CSS in pop‑up menu, add the external file to the Attach CSS file text box by clicking the Add Style Sheet icon, completing the Attach External Style Sheet dialog box, and clicking OK. When you’re finished, click Create in the New Document dialog box. When you select the Link to Existing File option, the file you specify must already have the rules for the CSS file contained within it. When you put the layout CSS in a new file or link to an existing file, Dreamweaver automatically links the file to the HTML page you’re creating. Internet Explorer conditional comments (CCs), which help work around IE rendering issues, remain embedded in the head of the new CSS layout document, even if you select New External File or Existing External File as the location for your layout CSS. (Optional) You can also attach CSS style sheets to your new page (unrelated to the CSS layout) when you create the page. To do this, click the Attach Style Sheet icon above the Attach CSS file pane and select a CSS style sheet. For a detailed walk-through of this process, see David Powers’s article, Automatically attaching a style sheet to new documents. Create an HTML page that contains the CSS layout you’d like to add to the list of choices in the New Document dialog box. The CSS for the layout must reside in the head of the HTML page. To make your custom CSS layout consistent with the other layouts that come with Dreamweaver, you should save your HTML file with the .htm extension. Add the HTML page to the Adobe Dreamweaver CS5\Configuration\BuiltIn\Layouts folder. (Optional) Add a preview image of your layout (for example a .gif or .png file) to the Adobe Dreamweaver CS5\Configuration\BuiltIn\Layouts folder. The default images that come with Dreamweaver are 227 pixels wide x 193 pixels high PNG files. Give your preview image the same file name as your HTML file so that you can easily keep track of it. For example, if your HTML file is called myCustomLayout.htm, call your preview image myCustomLayout.png. (Optional) Create a notes file for your custom layout by opening the Adobe Dreamweaver CS5\Configuration\BuiltIn\Layouts\_notes folder, copying and pasting any of the existing notes files in the same folder, and renaming the copy for your custom layout. For example, you could copy the oneColElsCtr.htm.mno file, and rename it myCustomLayout.htm.mno. (Optional) After you’ve created a notes file for your custom layout, you can open the file and specify the layout name, description, and preview image.